So, not something I usually do, but I’m going to take off the holiday and so there will NOT be a strip on Wednesday. I’ll post something, a blog and perhaps a drawing, but no strip. I’ve been working too hard and I’m going to take the holiday which most people take. I guess that’s fair. On other “glorious” news, it has been brought to my attention that even though I just did a strip on planet Uranus… that Nogg and Zorilla already passed Uranus in Late September. I’m not sure what I’m going to do about that, but I’m pondering it. Most likely I’ll change it to Neptune and rewrite the dialogue and see if I can pull it off without re-drawing. Add it to my list of things to fix before book #3 goes to printer. I’ll keep you posted when I do. All is well here. We and I drove out to visit the family over the weekend, and now we’re just going to sit around and for the first time, just enjoy out new place for a couple days and chill out. That sounds like a very very VERY good plan. Passing Uranus more than once is a problem? With Nogg driving? Maybe Uranus is so large that they took 20 strips to fly by it? MZ: Hey, is that a planet coming up? N: Oh yeah, that’s Uranus. MZ: Didn’t we pass Uranus earlier? MZ: Oh great, I’ve gotten the galactic equivalent of a NYC cab driver. Well, let’s at least stop for a bite. Aww, I was hoping they’d put their Ites out. I don’t see any tags for this strip. Am I missing something? @Ada, doh! Sorry. There you go, updated. Great fight scene, well done. Enjoy your xmas break, Chris! Dude, take a break! We all need a vacation! 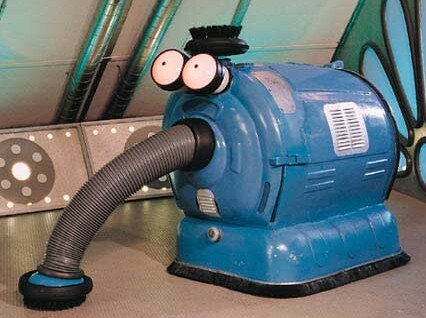 is it me or does the waste machine remind anyone else of that vacuum thing from the teletubbies? Well, at least we can surmise what the vacuum thing does in the Teletubbies’ house. The show is adorably creepy enough to make the worst assumptions, don’t you think? Covers the return to Uranus and refers to Mr.Zorilla’s disbelief that the planet is untouched, all while keeping in the tone of the series. Better than my idea of Mr.Zorilla’s button pressing antics altering the navigation systems without Nogg noticing. Nevertheless I’m sure you’ll find a solution to this oversight Chris.